11th Sep 2015, 4 p.m. CEST - 13th Sep 2015, 5 p.m. CEST, Location: The RAI Convention centre, Europaplein 22, Amsterdam, 1078 GZ, Netherlands. Click on image below to see Flickr Gallery of IBC Hackfest 2015! The winners of the first IBC Hackfest at IBC2015 in the Netherlands from September 11-13, a full weekend of hacking with the theme of Media Convergence and the Future of Audiovisual Content Creation, Distribution, and Monetisation were decided by a jury of industry executives on Sunday in Amsterdam. Coders, developers, designers, entrepreneurs, hardware hackers, UX and UI specialists and others came together and brainstorm over a couple of days to build out their ideas on the future of broadcasting over the weekend. "We challenged the hackers to mash up live sports tracking data from STATS, footage of a game, and real-time interaction powered by our LViS.io platform," said Tom McDonnell, CEO of Monterosa. "What emerged were two highly impressive prototypes from Dutch and Danish teams providing fans with new ways to enjoy football and other sports. We're actively talking to both teams about further investment in their ideas. " The Best Overall Hack was a team from London who were there until the wee hours of the morn and crashing in a nearby youth hostel for a few hours’ sleep. VITA was the project. Think Tinder meets recipes online, using user generated cooking video from YouTube. Best Overall Design was WooHoo which works by combining players’ location tracking with real time interaction where the web and the audience become one. In addition to this, one can show relevant statistics and players’ profiles (targeted on customer groups) and even advertise. With object based tracking (ie: players), they connected real-time data in a live stream. If the crowd tweets, a selection will be showed on the match screen at the player they’re tweeting about and while watching the match, people can tap on the screen and show their emotions with emoticons. Other hacks included Vidlytics which worked on end-viewer quality of experience when streaming videos using QoE Triangulation, manifest engineering and analytics. EMOMENT, Capturing moments through emotion and Old News, a second screen engagement platform for news programmes. Partners include Twitter, Amazon Web Services, Monterosa, Genius Digital, Beatgrid Media andStreamzilla. Driven by the IBC project management team and the Hackitarians, the IBC Hackfest offered of 5000 euros in prizes, three days of hacking, livecoding contests, algorave-style performances by Alex McLean and other international audiovisual artists, two nights of accommodation at the venue and the opportunity to show work to some of Europe's top players in the broadcast community. By tapping into API's and SDK's made available by technology companies currently, as well as scores of publicly available APIs, developers worked together with other participants to cultivate new ways of tackling old problems. “We are really thankful for our partners and IBC getting behind the concept of real time innovation and hacking to make this all possible,” said Hackitarians founder Richard Kastelein. “The most important result was that three of the projects look like they will move forward beyond IBC Hackfest and perhaps go to market one day. And we made some great new friends of course." The IBC Hackfest was created to help drive innovation in both the old and the new realm of broadcast entertainment. 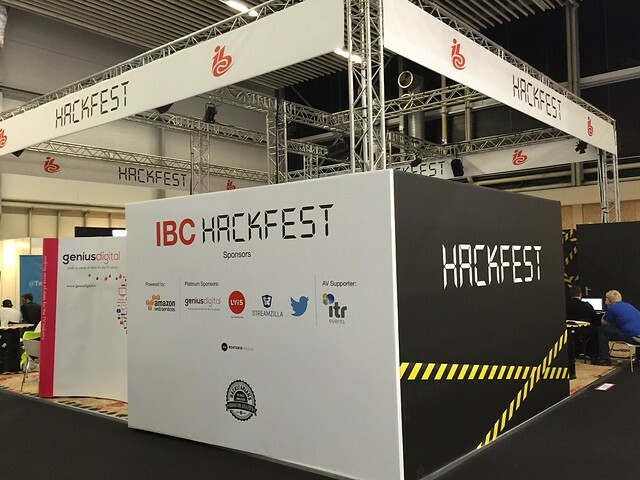 With over €5000 euro in cash prizes and a hugely influential jury of broadcast industry professionals to judge the hacks, The IBC Hackfest is a creative space where hackers come together for three days and two nights in the heart of the show floor of IBC with over 55000 attendees expected in 2015. Located in Hall 5, the IBC Hackfest will provide a forum to help create hacked solutions and inventions. We will be empowering young talent with bright ideas to take on new and exciting challenges and brainstorm and build new ideas in an innovative environment. The IBC Hackfest kicks off in Amsterdam on the Friday, September 11th running through to Sunday September 13th for a full weekend of hacking — where coders, developers, designers, entrepreneurs, hardware hackers, UX and UI specialists, data scientists and others come together and brainstorm over a couple of days and build out their ideas in a short term innovation event known as The IBC Hackfest. We will feed you for three days and two nights. You are welcome to sleep at the venue if you want to work all night but you must bring your own bedding and roll to sleep on the floor. The best work often happens at 3am we find, so feel free to hack all night if you like! There will be two parties, one pre-event party with drinks on Friday night and a post event party on Sunday night as well. It will be loads of fun and we offer networking with top industry players! You will need a pass to get into IBC exhibition which normally is 70 euro but free for IBC Hackfest attendees. Simply go to http://www.ibc.org/register using this code (13687) to avoid any fees. Sign up here at The Hackfest site as well. Then make your way to Hall 5 where you can find us here. If you can't make it Friday feel free to start on Saturday! We will run all night Saturday into Sunday as well. Besides all the hacking, we are extremely excited to host two nights of live coding mayhem in collaboration with Livecoding.tv and Toplap collective. Some of Toplap's best live coding artists, such as the inventor of the algorave Alex McLean, Alexandra Cárdenas, Rodrigo Ramírez, Shelly Knotts and Mike Hodnick will be showing off their skills through the Livecoding.tv platform - an educational livestreaming platform for watching engineers code products live. Click here for more information on Algorave on this site. Read an article about the Algorave movement in Wired Magazine. The world’s media is converging and the rules are being rewritten... from brands creating content like Red Bull to production companies going direct to viewers. There are now Youtube stars that have audience and viewing numbers that make broadcasters look insignificant. Distribution and rights are the new dilemma and IP and terrestrial are squaring off in a new standoff, battling for ad dollars. Fragmentation of audiences is driving viewing numbers down as the broadcasters’ gatekeeper role in the living room is being bombarded by OTT and gaming culture. Internet players are coming to TV and TV is moving to the web. Traditional broadcast and cable TV are undergoing disruption. That’s clear - and the best way to tackle the effect is to innovate. Hackfests are short term innovation events, where sponsors can set challenges to hackers and essentially outsource their innovation for a weekend and push outsiders to look at their brands in a new light. For industry companies trying to build a developer community, the IBC Hackfest is a necessity. For innovators looking to win some cash and show their ideas to a jury of industry thought leaders there are lots of reasons to participate. Why Should you attend the IBC Hackfest? Because the opportunity to present to a jury full of decision makers is a great opportunity to get your talent in front of influential people who are paying attention. Because it’s great to meet new people who share your interests and meet people who come from different sectors, cultures and have different skillsets. Because we don’t do pizza and Red Bull, we do fresh food and great European beer (as well as fresh juices, real coffee, and mineral water). Because you just want to build cool stuff. Because it’s a great way to win some cash on the weekend. Because the IBC Hackfest organisers are long-time hackers and understand hacker culture and take good care of the attendees. Because sitting around a dorm room at university or at home is full of distractions whereas the IBC Hackfest is all about focus and getting things done. Be there and help build new, creative disruption.